James Owen, Jr. recognized that an increasing number of Detroit residents could afford elegant homes near downtown as economic developments in the late 19th century made Detroit into one of the nation’s leading industrial centers. In 1894, residential development began on the east side that contained a race track in an area known as Cooks Farms . James Owen was one of the early developers who subdivided this location and promoted the expensive homes now found there. In the process, the developers selected the name Indian Village for the neighborhoods now bounded by Seminole, East Jefferson, Burns and Mack. Even before his developments in Indian Village, James Owen had the resources to erect this red brick eclectic Victorian style home that you see on Frederick. At that time, Detroit’s population was growing rapidly with most homes for the upper tier built along the Woodward corridor. The Hecker and Whitney chateaux are within walking distance. During and after World War I, the city’s African American population grew rapidly because of the jobs in the auto plants, but restrictive practices and intimidation kept many blacks in the Hastings Street area. By the 1920s, the northwestward movement of African Americans reached Frederick Street and then, shortly thereafter, East Ferry. Bertha Hansbury and her husband, William H. Phillips, purchased the Owen home in the 1920s. She received her training at the Detroit Conservatory of Music and in Germany. She established the Hansbury School of Music and tutored many of the city’s African American children. This location was also the site of the Household Art Guild, which was the first state-licensed employment agency for African Americans in Detroit. The Hansbury School did not survive the devastating Great Depression. The Frederick Street Historic District once included more impressive late 19th-century homes, but now has just two: the Owen House and the Romanesque Revival style home at 580 Frederick built by Charles Warren which was the home of the city’s first African American hospital, Dunbar Hospital, founded there in 1919. Subsequently, it was the home of Charles Diggs, the first African American to represent Detroit in Congress and the fourth black elected to Congress after the end of Reconstruction. State Registry of Historic Sites: The Frederick Avenue Historic District (P25120) was listed April 11, 1977. There is no State of Michigan Historical Market. 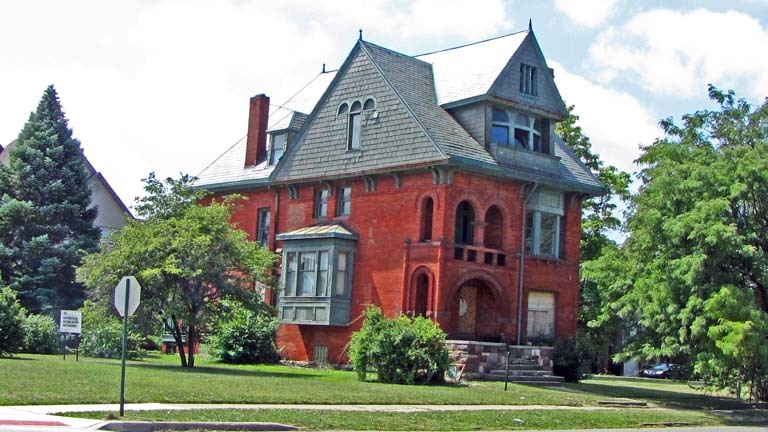 The City of Detroit’s Frederick Avenue Historic District also is comprised of these two late 19th century homes.